Make Up Monday: Everyday skincare routine! 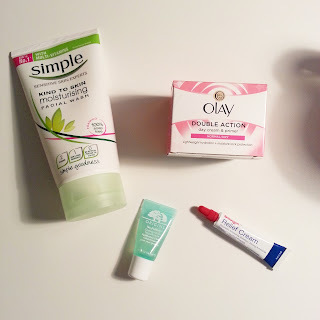 Before I begin mirroring my Mum with my face cream, I like to use a "Simple" face wash, I use this morning and night, seven days a week without fail. I simply can not start my day or go to bed at night without washing my face. Sleeping in make up...forget about it! This one is a foaming face wash and is 100% soap free. I know "Simple" have other kinds but this is my 'go to' one. I have tried other face washes before but I always go back to this one, it just feels nice on my skin and doesn't make it dry out like some I have tried in the past. Next I apply my cream exactly how I watched my Mum do all those years ago, I even use the same cream as her. 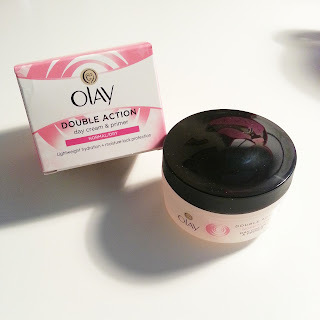 Again I have tried others but always come back to Oil of Olay every time. I usually use the ones that are for normal/dry skin as this is what Mum gets. They do have night creams but I tend to just stick to putting this cream on in the mornings before I put on a little make up. I like to let my skin breathe at night...if that's even a thing!? I love the Oil of Olay creams because they never make my skin feel oily. Once I've applied it, I let it dry for a few seconds then apply my make up and it doesn't feel sticky or heavy. Plus it definitely makes my skin feel moisturized. The last of my routine (for no makeup days) is applying some Blistex (formally Blistese) to my lips. Now this would have to be my MUST have item, I honestly can not live without it. Mum always stocks us up when we go home, as we haven't been able to find this type over here yet. It is a relief cream for cracked, dry lips etc but it has a bit of a gloss/shine to it as well. I HAVE to put this on morning and night otherwise my lips are just too dry. I tend to use a regular chapstick while at work as it's easier to apply but the minute I get home, I head straight towards my Blistex. I've been using it for as long as I can remember, again thanks to Mum. I would recommend it to everyone as it is definitely the best Lip cream I have ever used! Another item I have recently started using, which is also pictured above is "Origins no puffery" it is a cooling roll on for puffy eyes. Lucy has been using their day and night cream and swears by them. She also has an eye cream, so when she got this sample she let me use it. I put it on every night before I go to bed. I'm not sure if that's the best time for it or whether I should be putting it on during the day but I like to think of it working it's magic at night. I can't say I've noticed a huge difference but I do feel like my eyes look less tired and puffy in the morning so maybe it is working more than I realize. Lucy is a huge fan of the "Orgins" skincare brand. I may even try their night cream next per her recommendation. So there you have it, apart from my make up bag, these are the products I use on a day to day basis and could well be some of the factors in our looking like teenagers comments! Let me know what your go to skincare products are and what you would recommend!